As some readers will know, certain dogs are petrified of going up and down stairs. To us it can seem silly - its just stairs! But it is important to keep in the forefront of your mind that your dog is not ‘pretending’ to be afraid or is just being strange. From their perspective their fear is entirely rational and justified. Just like a child petrified of thunder storms or the dark, the stairs for some reason have taken on monstrous proportions in their mind. It is often helpful when approaching this fear, or any other, to first try and determine where it might have come from. 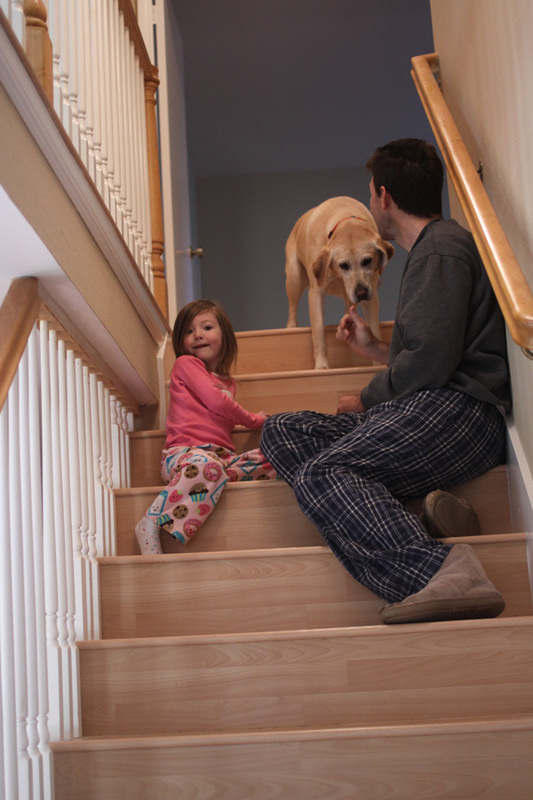 Has your dog fallen or tripped down the stairs and been in pain because of it? 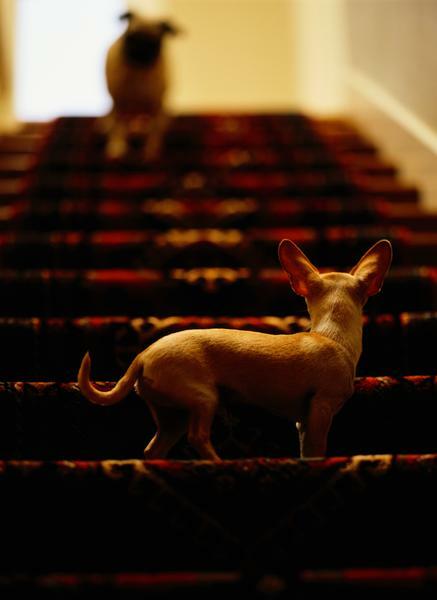 Might, if your dog is a rescue, it have been yelled or abused near or on a stairway? Or has it simply never encountered stairs before and finds them a new and alien addition to their environment? To transform your dog into a champion stairmaster it is your job to change the stairs from Enemy No. 1 to the place where amazing, great things happen. Forcing or dragging a dog up and down is a big no-no – whilst it may make them actually physically climb the stairs, it can only reinforce their idea of the stairs as being a nasty place to be best avoided if possible. Instead, begin training with treats and toys on hand. Be patient and reward any progress, no matter how small, your dog makes towards conquering their fear. Hold the treat or toy over the bottom step and if they put their front paws on top in order to reach it praise and reward excessively. When the bottom step becomes no big deal, move onto the next one. Remember to pace yourself – 10 minute training sessions each day can often be better than an hour long session one a week where your dog’s attention span is strained and you start to become frustrated. Also keep in mind once your dog has learnt to go upstairs, descending will be a new experience that will likely require a training process similar to what you have just completed. 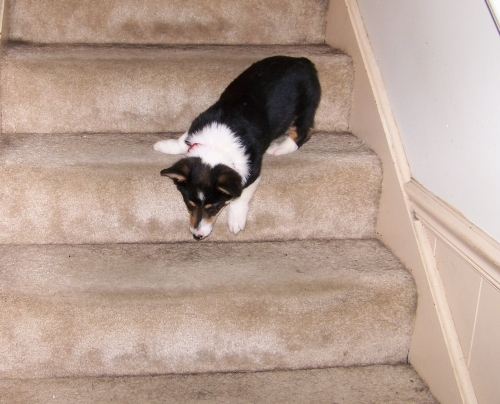 With patience, your dog should learn that stairs are harmless and nothing to be worried about. However, if your dog has serious issues, and no amount of perseverance on your part seems to have any effect, it may be time to ask if your dog really needs to go upstairs or call in the services of a professional dog trainer. For some dogs, the severity of their worries may not be worth the distress they will suffer trying to conquer them and it may just be best to leave things be.